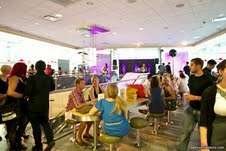 Last night was a first PrivyDolls, a fashion show exclusively designed at the top level of the Rock N' Roll Mcdonalds in the heart of downtown Chicago. The space is a meca past 4am , and honestly can say I haven't been a customer before that until last night. The media only event was huge brand initiative that just 'made sense'. You may of seen the campaign billboards and photos on buses of this very fashion forward push from McDonalds. They are promoting their 45+drink options and to "drinkcessorize". This is one show that the masses would of enjoyed. Instead of waiters passing apps of the dainty size, quarter pounders and chicken nuggets were on trays and cokes and smoothies were passed in small cups. I think everyone had to leave their stuffy fashion attitude behind when media cameras kept capturing me eating greasy fries. 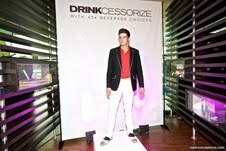 The fashion show was a mens ands womens showcase of Akira's summer collection that included the models carrying McDonald's drinks. The perfect summer accessory if you ask me! Trends for the summer included bold colors, yellow scarves, nautical prints, and white blazers and pants. It was a very light hearted, different kind of event that really tied McDonald's new campaign to street wear. I may of double thought eating one of everything as the size 0 models pranced through the restaurant though! McDonalds has never looked cooler! back down the road. I want to encourage you to continue your great posts, have a nice holiday weekend!